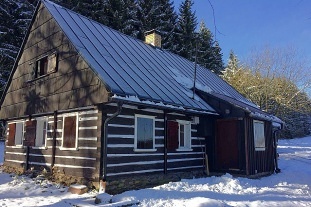 Rent cottage Kateřina - Orlické Záhoří - Jadrná. 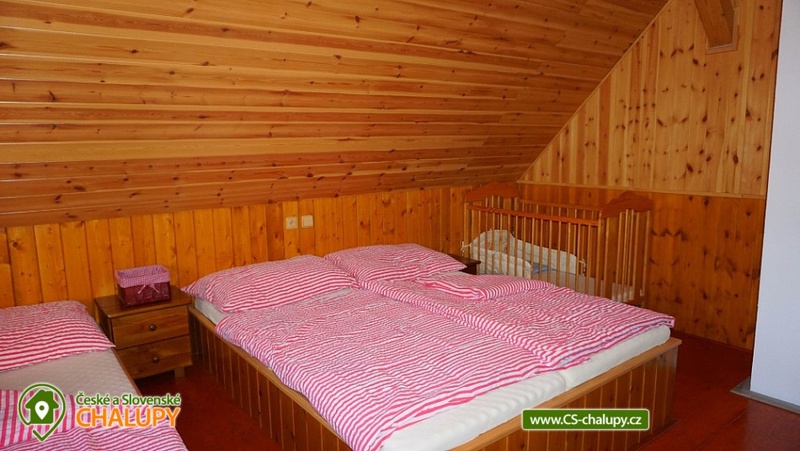 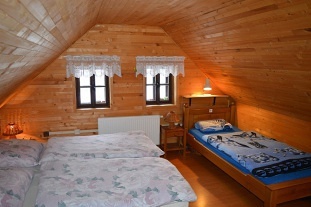 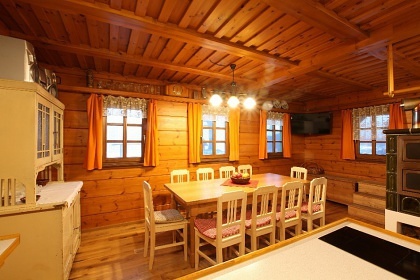 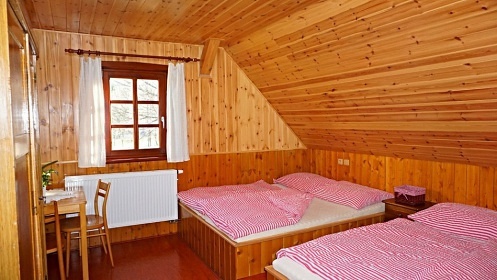 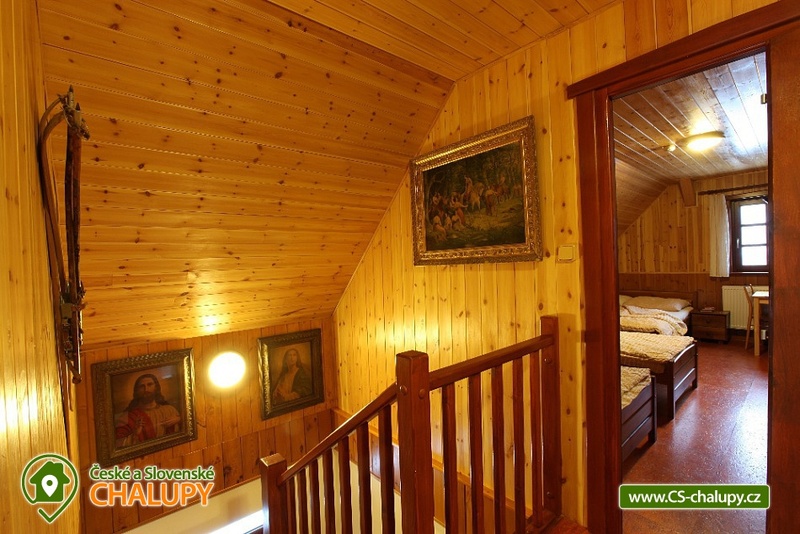 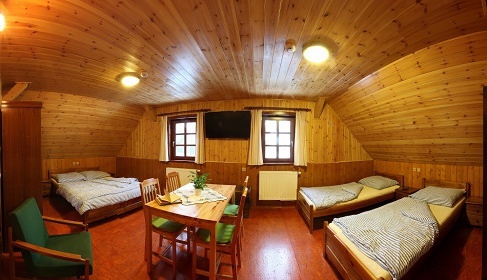 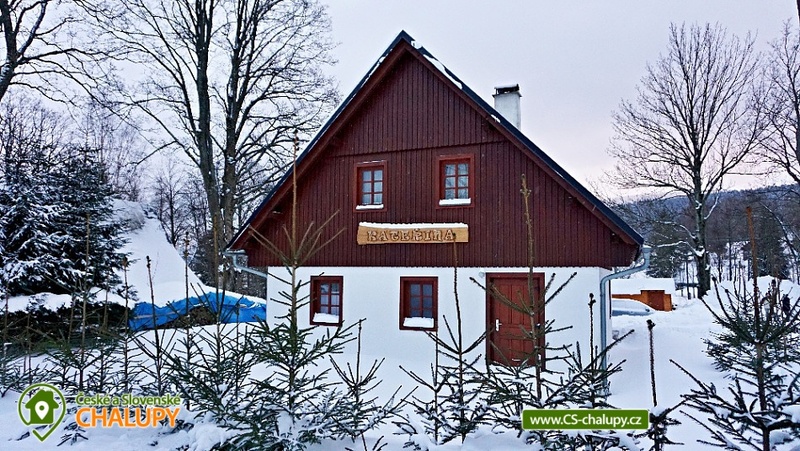 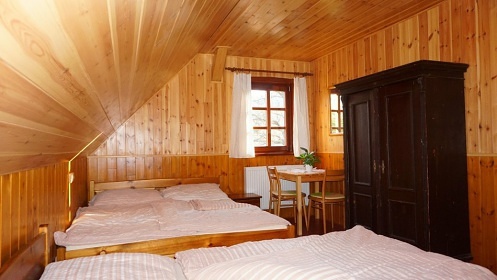 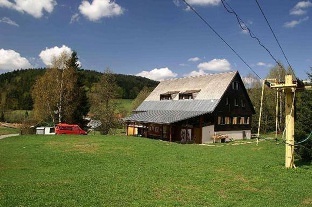 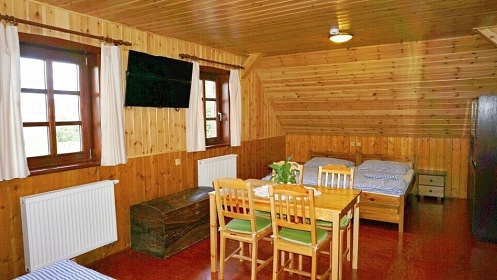 Accommodation timbered cottage Orlicke Mountains. 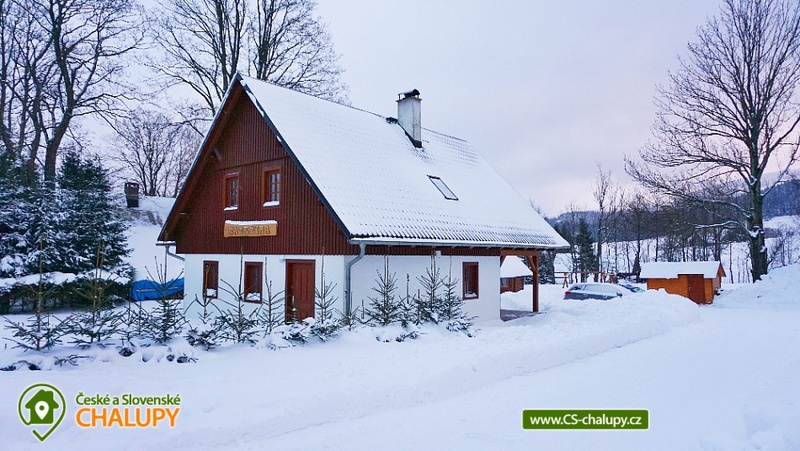 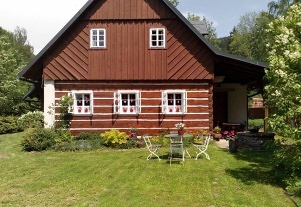 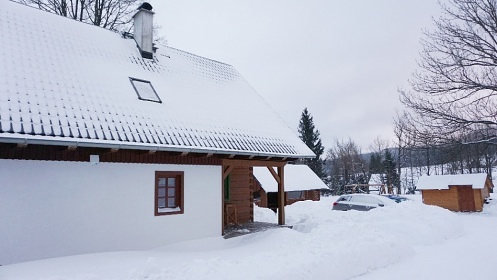 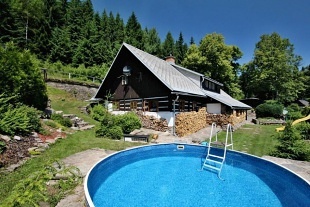 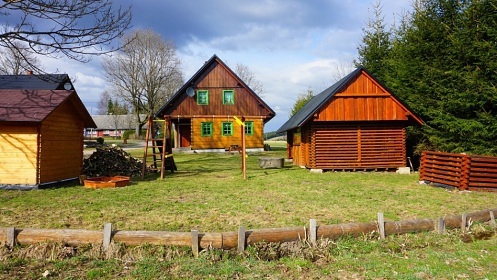 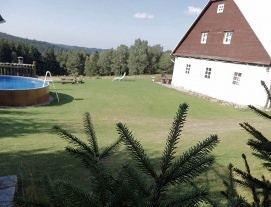 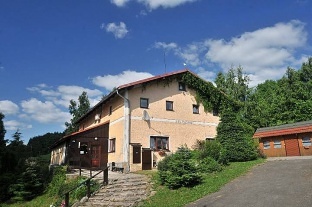 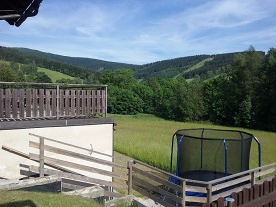 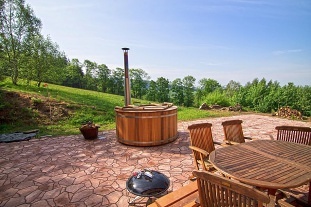 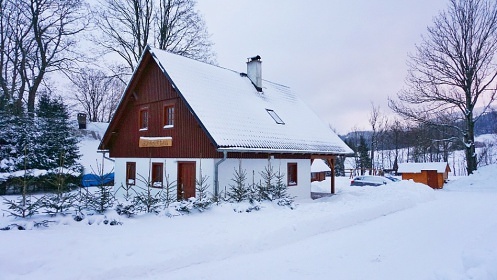 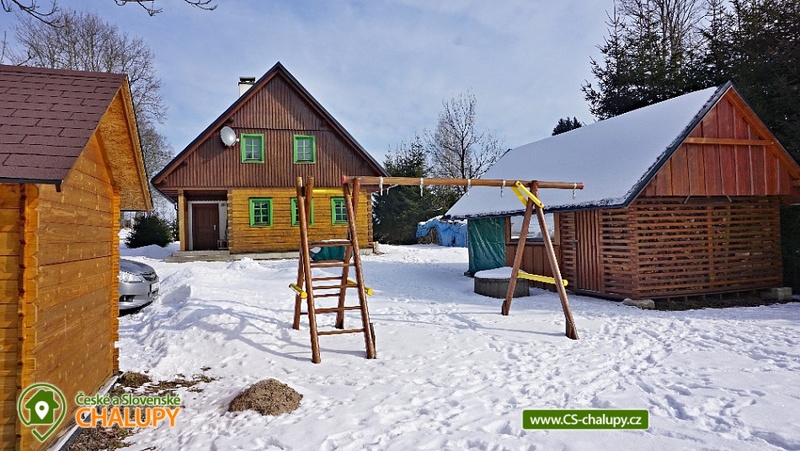 Rent cottages Orlické Záhoří, district Rychnov nad Kněžnou. Our cottage with a total capacity of up to 14 people offers accommodation for 12 persons in 3 bedrooms and another 2 beds for the furnace. 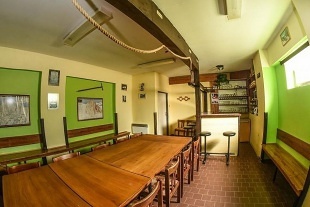 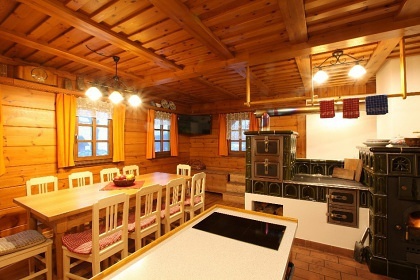 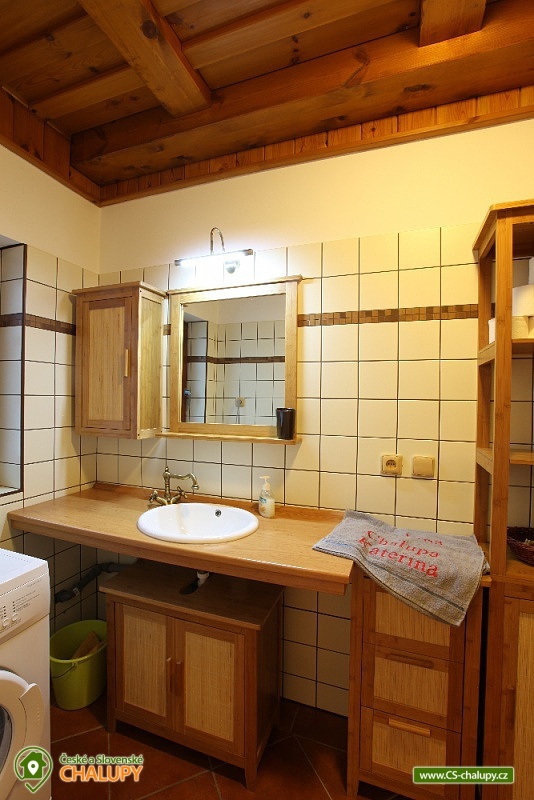 On the ground floor of a timbered cottage there is a common room connected with the kitchen (kitchen equipment: fridge with freezer, electric oven and electric hob, microwave, dishes for bigger group of people, large table). 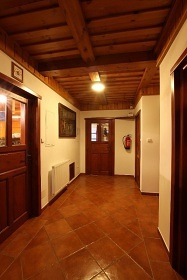 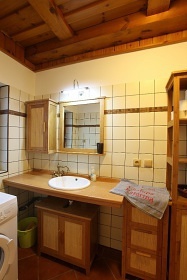 In the common room there is a TV, hi-fi and especially a traditional tiled stove with bed. 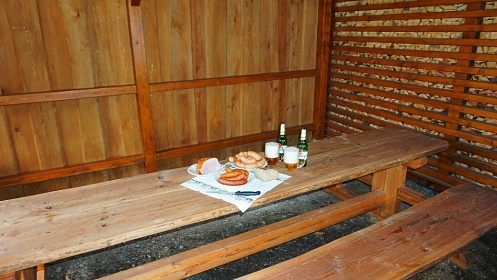 The kitchen can be cooked on the el. 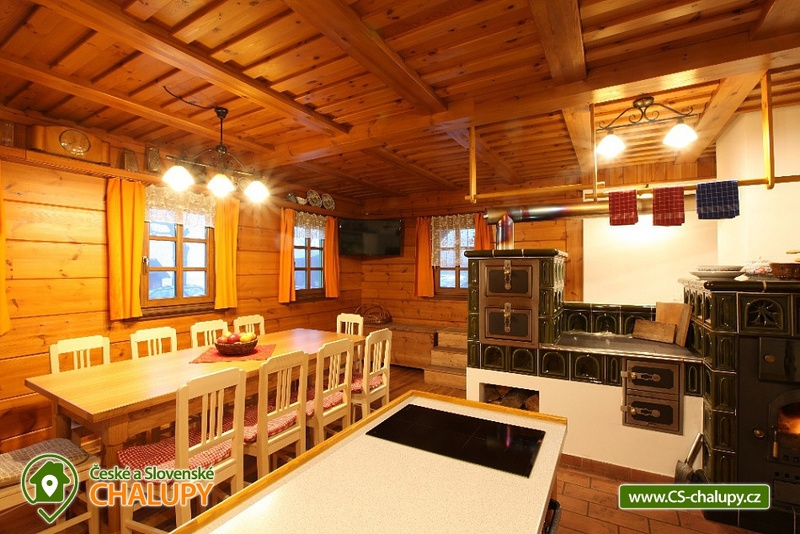 hob, right on the oven, where you can of course bake. 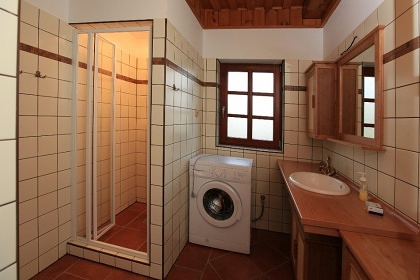 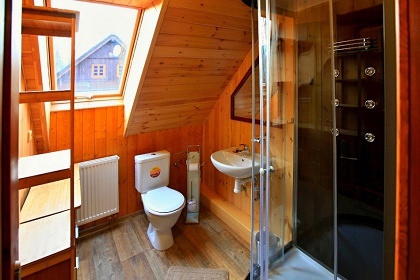 On the ground floor there is a bathroom with washing machine, separate toilet and utility room. 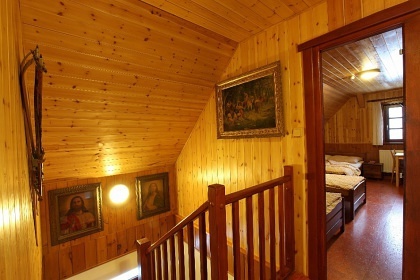 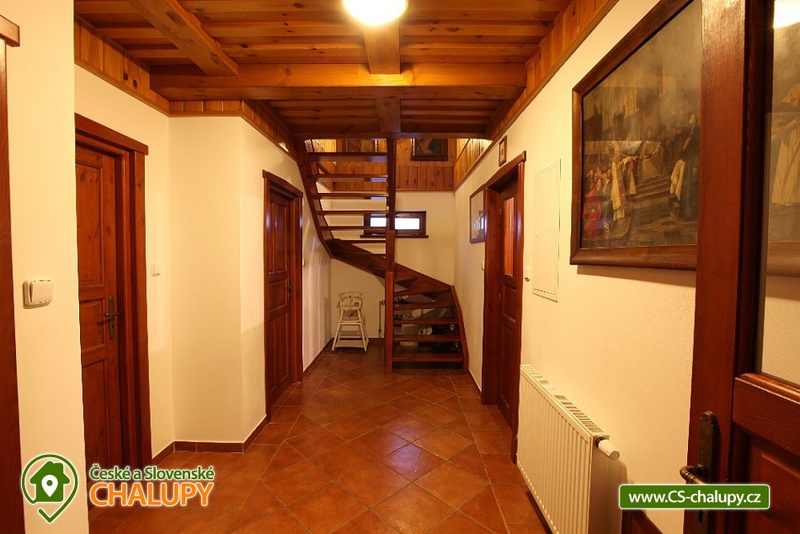 Upstairs there are 3 bedrooms, each bedroom has 4 beds. 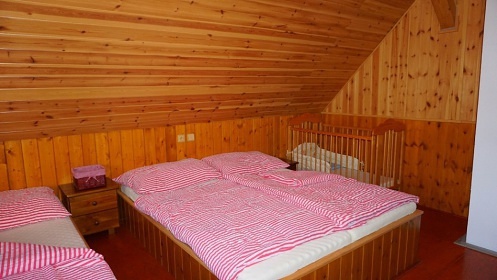 One of the bedrooms is an apartment (more spacious, there is a TV, armchair, chest with toys). Upstairs there is also a bathroom with shower and toilet. 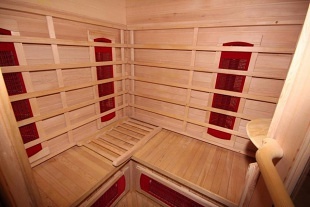 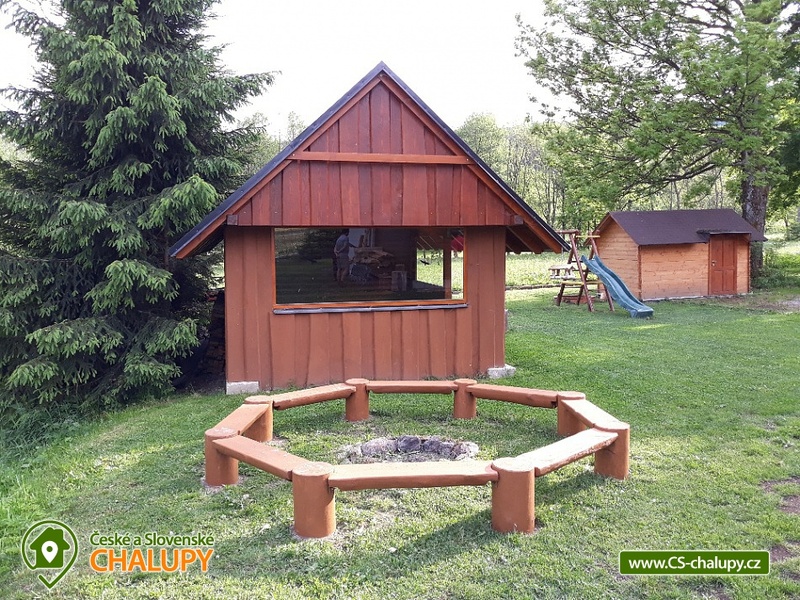 Outside is covered also outdoor seating, grill, fireplace, swings and slide for children, sandpit. 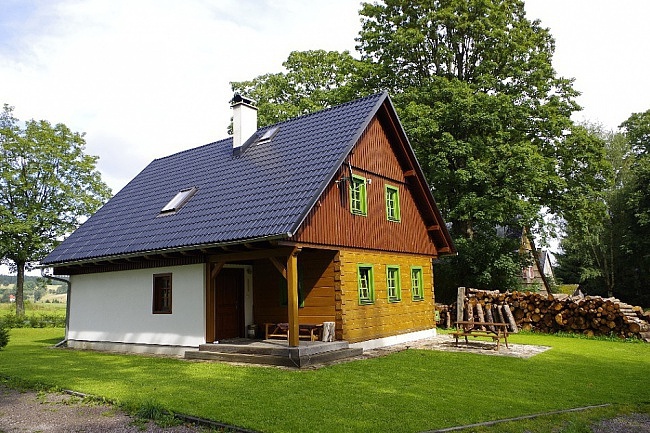 You are always renting the whole, regardless of the number of people. 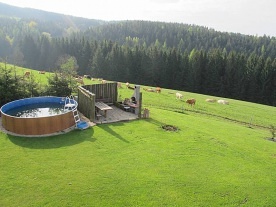 Pets are allowed but charged. 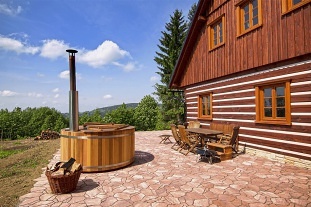 It boils with briquettes in tiled stoves with heat distribution throughout the cottage. 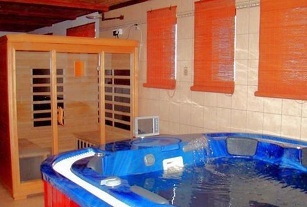 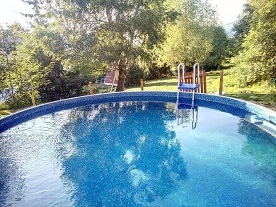 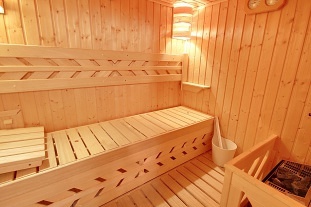 Hot water is heated in summer. 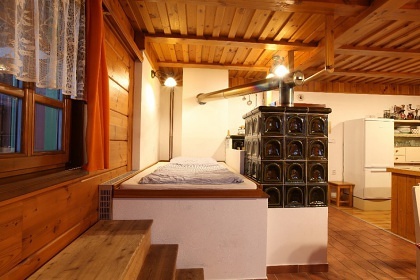 boiler, heated in winter by the heating system to a combined boiler. It is parked directly by the cottage, in winter the parking lot is heated. 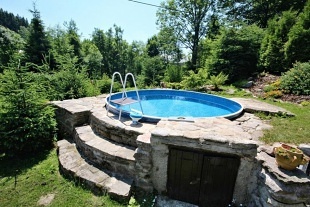 Wi-Fi internet is available in the cottage. 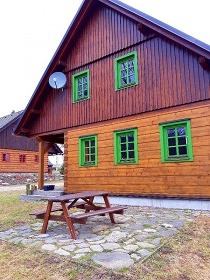 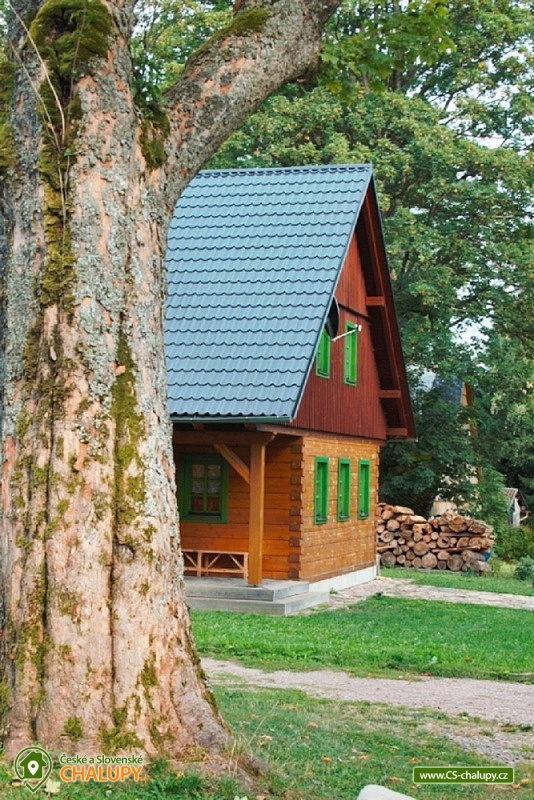 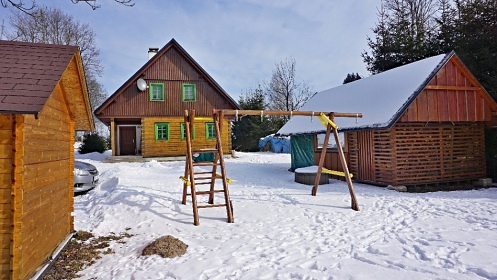 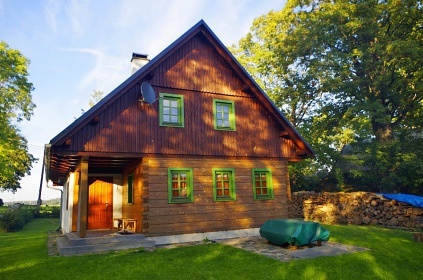 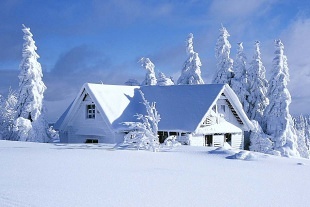 The cottage is located in the Eagle Mountains in the Orlické Záhoří village. 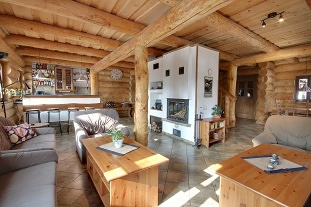 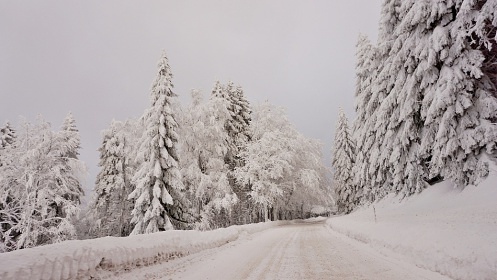 It is a ski area where you can choose between downhill skiing and cross-country skiing. 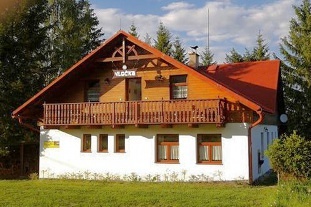 It is an area full of modern ski resorts (Ski Resort Jadrna 900 m from the cottage, Bedřichovka ski area), Deštné Ski Center in the Orlické Mountains and Říčky Ski Center, a few kilometers from the border with Poland, Ski Zéleniec. 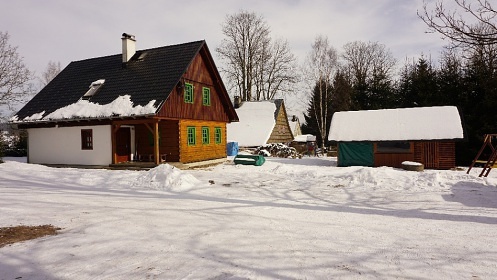 Now there is a new running track in Orlické Záhoří, which connects to many existing cross-country skiing tracks. 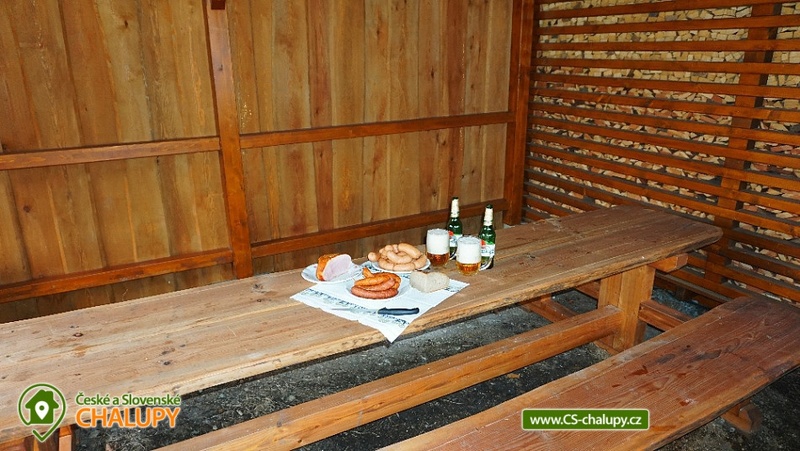 In the summer, hikers and bikers will come to their lovers. 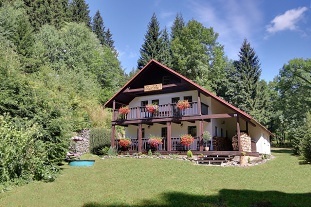 The popular places of visitors to the Orlické hory are for example the Five-Eyed or Hiking on Big Deštná Mountain, Luisino Valley. Do not hesitate and come to visit the beautiful Orlické hory.Next recommended places to visit in the surroundings: Kunštát Chapel, Komárov Hill, Zakletý Hill, Zdobnice, reservation Border meadow, Anenské Hill, Little Deštná, Říčky, Zákoutí, Deer Bath, Shelich, Hanička Fortress, Reservation Bukačka, Špičák, Antoninovo Valley, Sedloňovský vrch, Vrchmezí, Rokytnice, Bartošovice, Sedloňov, Olešnice, Olešnice Nature Trail, Kunvald, Zemská brána, Čihák, Klášterec nad Orlicí, Rychnov nad Kněžnou, city swimming pool Rychnov nad Kněžnou. 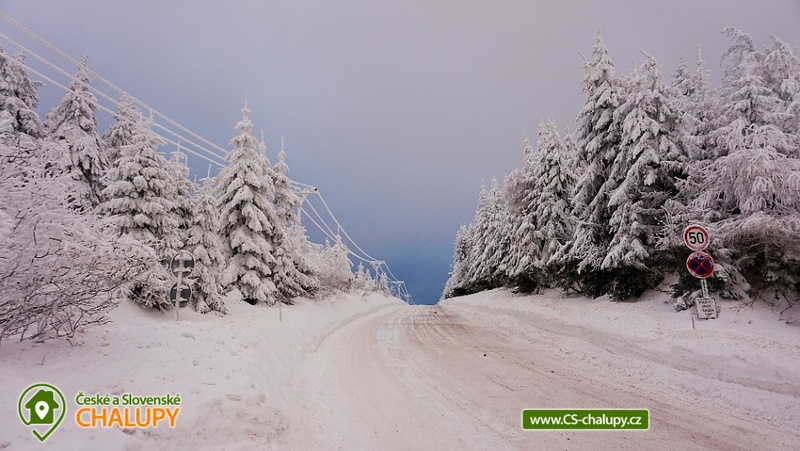 Additional information Pobyty v zimní a letní sezóně jsou vždy sobota 14.00 h - sobota 10.00 h. K ceně nájmu se připočítává spotřebované energie dle skutečné spotřeby. 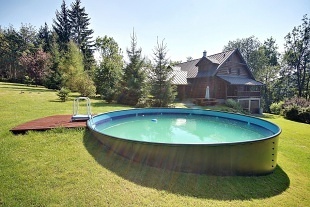 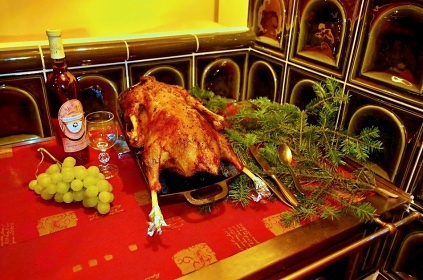 Víkendové pobyty začínají v pátek v 15.00 h a končí v neděli dle domluvy. 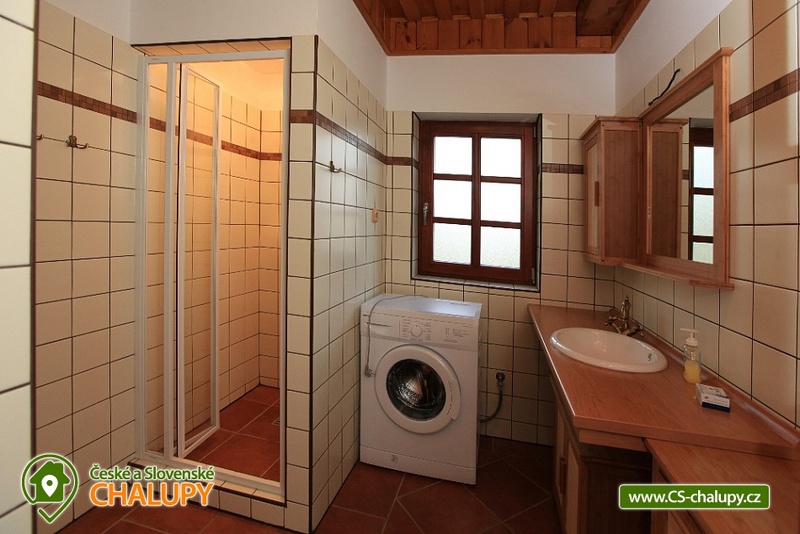 Additional information V ceně pronájmu jsou: lůžkoviny, utěrky, toaletní papír, úklidové prostředky, rekreační poplatky, úklid. 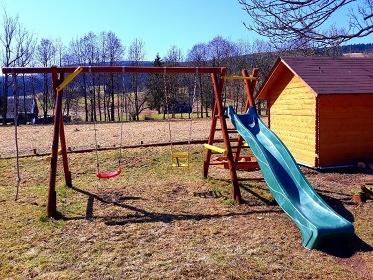 V ceně pronájmu není: elektřina a topivo (brikety).